The parade of the King's Army on Horse Guard's Parade in 2012. 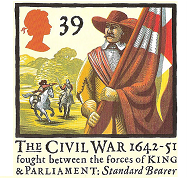 Jan 24 Holly Holy Day 2015: Day commemorating the lifting of the Siege of Nantwich in 1644. Expect living history displays, cavalry, music, molly dancing, plough witches and other activities, with the battle re-enactment on Mill Island just on the west side of the town centre at 2pm. Jan 25 (11am - 1pm): The King's Army of the English Civil War Society traces the route of the King's last walk from St James' Palace in the Mall to his place of execution at the banqueting House in Whitehall. The army will be draw up on Horse Guards Parade, with a wreath laid outside the Banqueting House. Jan 31 (12pm): Sung Mass at Saint Mary de Castro, Castle Street, Leicester, to commemorate the 'Martyrdom of King Charles'. An exciting series of events has also been announced for the May bank holiday weekend to celebrate the opening of the National Civil War Centre in Newark. 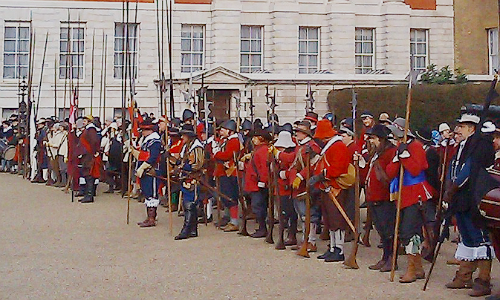 Over the weekend of 3-4 May 'Fortress Newark' will feature re-enactments, displays, parades and living history to bring the Civil Wars to life, with up to 1000 members of the Sealed Knot, English Civil War Society and History Re-enactment Workshop taking part. More details can be found on the Events calendar.